Have you ever loved someone so much? Like this post if your answer is yes. Jeanette Winterson is a genius. She eloquently creates for her readers a different world filled with an escalated sense of being and logic, real life looks dull beside it. Written on the Body is so powerful and thought provoking that I was practically hyperventilating while reading. And seriously, I wasn't able to put it down. One evening, I found it difficult to sleep. It was around 10:30pm. I thought of starting my Written on the Body experience, and voila, by 12:30am I was done. I was undid. I was remade. 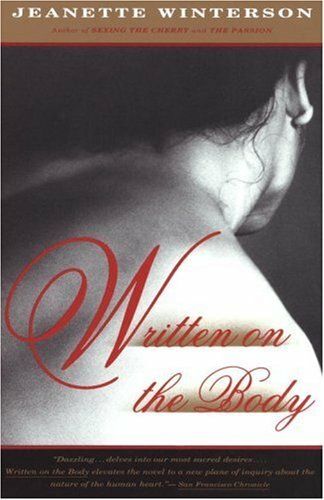 Written on the Body is the perfect book to give a loved one this holiday season, or anytime of the year. Die-hard romantics would love it as much as those who aren't. It is an incomparable work of art. Written on the Body, as it claims, but is undeniable rooted in the heart. Written on the Body is an inescapable love story...similar to the person you truly love and can't do without. It is about true love and the mistakes that came before and in between. It's a modern take on marriage,m infidelity and the social constructs that define the two. It's about hurting and healing, It's an all-around love affair with the realities that comes with having an affair with love. "Don't be long darling. She pauses. I've tried to get you out of my head but I can't seem to get you out of my flesh. I think about your body day and night. When I try to read, it's you I'm reading. When I sit down to eat, it's you I'm eating. When he touched me, I think about you. I'm a middle0aged happily married woman and all I can see is your face. What have you done to me?" You never give away your heart. You lend it from time to time. If it were not so, how could we take it back without asking? "Cheating is easy. There's no swank to infidelity. To borrow against the trust someone has placed in you costs nothing at first. You get away with it.You take a little more and a little more until there's no more to draw on. Your hands should be full with all that taking but when you open them, there's nothing there." "I miss you Louise. Many waters cannot quench love neither can floods drown it. What then kills love? Only this. Neglect. Not to see you when you stand before me. Not to think of you in the little things. Not to make the road wide for you, the table spread for you. To choose you out of habit not desire, to pass the flower seller without a thought. To leave the dishes unwashed, the bed unmade, to ignore you in the mornings and make use of you at night. To crave another while pecking your cheek. To say your name without hearing, to assume it's mine to call." Written on the Body (Php 596) is available at Fully Booked. For inquiries, visit their website here. Please watch this video below, taken from http://www.ted.com/. Isabelle Allende tells tales of passion. "What matters most more than training or luck is their heart. Only a fearless and determined heart will get the gold medal. Isn't it always true? Heart is what drives us and determines our fate."